Many centuries ago, when I was in school, we had Home Economics classes. That is to say, the girls did. The boys had Shop. I’m not sure what our process was at home. Mainly I remember regarding all household chores as loathsome wastes of valuable time I could have spent reading. I do remember that the Home Ec method involved more or less the same order of events as in the Victorian-era approach. 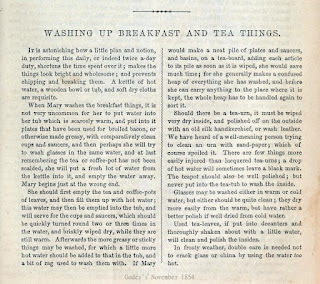 Otherwise, though, Godey's advice seems to modern eyes rather slapdash, not to mention unhygienic. And so it’s a good example of a world that hadn’t yet caught onto BACTERIA, let alone grown hysterical about the little critters. 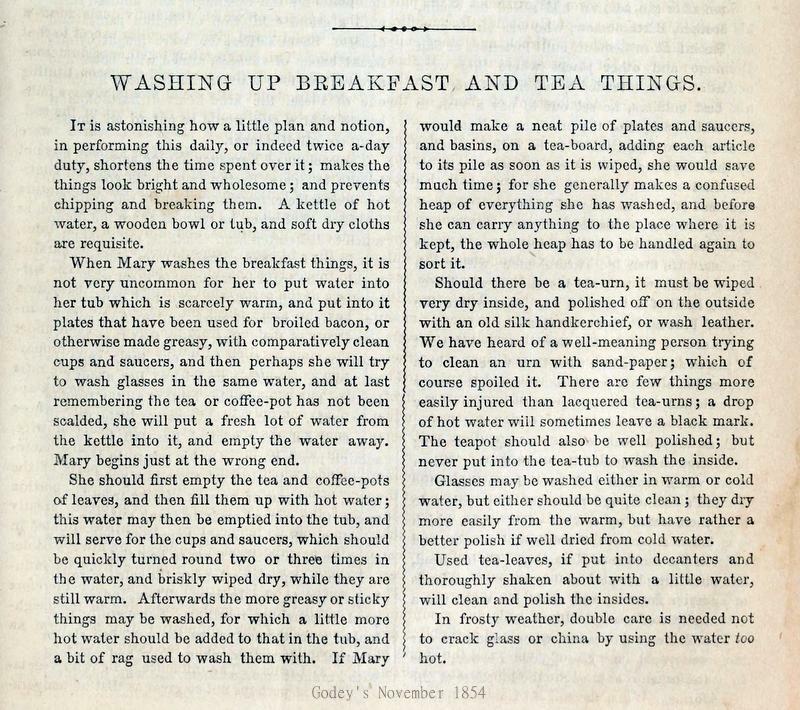 The Victorians didn’t have hot water on tap, either, or instantly-dissolving dish cleaning liquids, or the host of other allegedly labor-saving devices available to us. I’ve read elsewhere of cleaning rugs and other items with used tea leaves, a method I haven’t tried, but I’m thinking of experimenting with certain bottles and decanters. 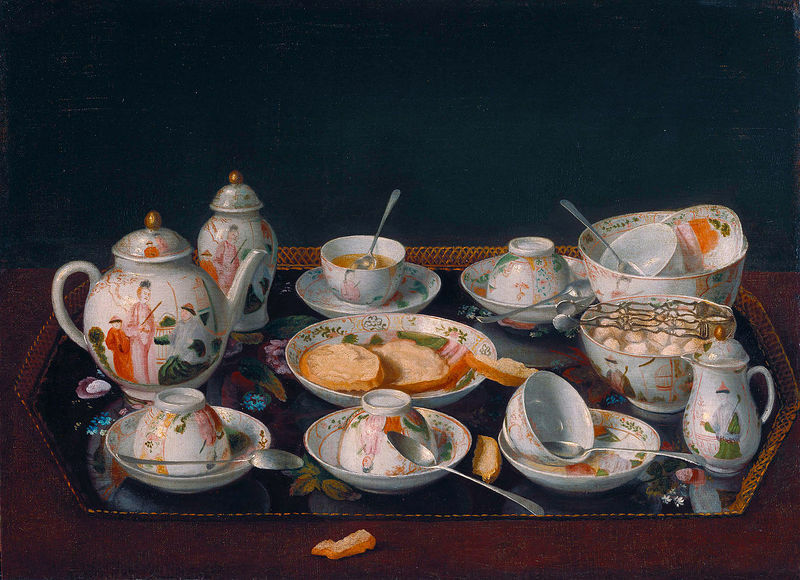 Image: Jean-Étienne Liotard, Still Life: Tea Set (circa 1781-83), courtesy Getty Center via Wikimedia Commons. That's almost the order I learned in home economics class and from my mom. The exception is we washed clear glasses first, then the order listed. We used hot water and hot rinse water, though, having the advantage of indoor plumbing, thank goodness. 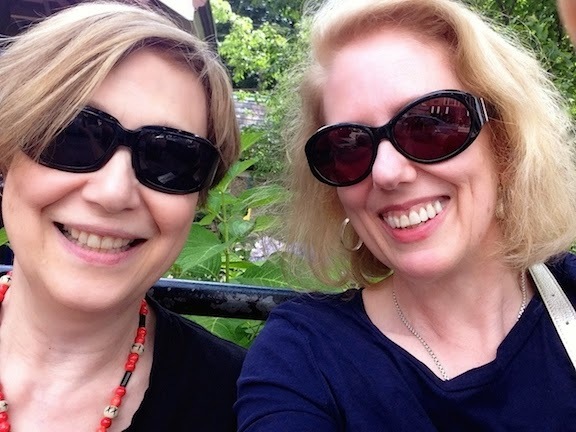 I love your blog, by the way, and never miss reading your posts. The janitors at my High School were an elderly husband and wife pair -from Scotland originally. The corridor floors were a really tough linoleum (so much more sensible than wall-to-wall carpet), They used to dump a large batch of damp used tea leaves on the floor in front of their push brooms to clean the corridors every afternoon. Did a good job of it too. What a great image. And good topic too. I don't think you will be able to clean decanters with used tea leaves. From my very distant youth, their use was to collect dust that otherwise might rise in clouds. they didn't have any cleaning properties of their own. Does tea stain? I see that it does not contain tannic acid, as I had thought, but instead tannins. Tannic acid stains something impressive :-) as I recall from a chemistry set event in my youth. And the web seems to think tannins do as well. Karen Anne, tea stains quite impressively. Ask my dental hygienist. The women in my family used it on linens to get a beautiful pale brown/ecru/natural sort of color. I've used it to dye white underwear. To clean anything narrow (jars, bottles, etc) a tip was posted in one of the cooking magazines I've owned to put hot water, a bit of fresh (dry) rice and a tiny bit of detergent in the container, stopper it, shake vigorously. The dry rice scrubs the crud out of the narrow container without the hassle of trying to find some specialized thing to reach the very bottom.